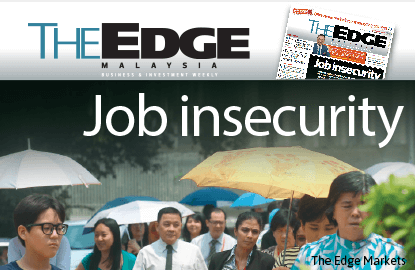 KUALA LUMPUR (Oct 17): After almost two decades of near-full employment in the labour market, low unemployment has become a cornerstone of Malaysia’s economic fundamentals, and might even be taken for granted despite the growing economic headwinds, according to the Edge weekly. In its latest edition, the magazine’s writer Ben Shane Lim questioned that as growth decelerates and confidence falters, was it realistic to continue assuming that the low unemployment seen since the 1997 Asian financial crisis can be maintained? After all, news of retrenchments have been cropping up regularly, and with household debt approaching 88% of GDP, the resilience of the job market has never been more critical, said the Edge. The magazine highlighted that the latest round of retrenchments saw Shell Malaysia announce that it would cut 1,300 upstream jobs from its 6,500-strong workforce over the next two years. For perspective, there were over 10,000 retrenchments in 2014. In the 12 months ended June 2015, there have been almost 12,000 already — not including Shell’s, it said. The Edge said job cuts in the oil and gas industry may be expected because of the collapse of oil prices but there has also been a wave of retrenchments in the banking sector this year. It began with Standard Chartered Bank cutting its Malaysian workforce by 11%, followed by CIMB Group Holdings Bhd (3,599 employees, or 11% of its headcount) and RHB Capital Bhd (2,700 employees, 15% of workforce), said the magazine. It said that more recently, it was reported that AffinHwang Capital Sdn Bhd is in the midst of retrenching a couple of hundred employees as well. The Edge said some manufacturers have also made the news for trimming their workforce, such as Naza Automotive Manufacturing Sdn Bhd, which let go of 255 workers from its plant in Gurun, Kedah. CCM Fertilisers Sdn Bhd, a subsidiary of Chemical Company of Malaysia Bhd, also announced that 232 employees will be affected by the shutdown of one of its plants in June next year. The magazine added that against this backdrop, Malaysian Airline Systems Bhd (MAS) retrenched nearly 6,000 employees as part of Khazanah Nasional Bhd’s plan to restructure the loss-making national carrier. “Are the retrenchment figures something that we should be worried about? I think, yes. Apart from the retrenchment of about 11,000 to 12,000 workers, employers are not hiring. With the economic slowdown and uncertainty, employers are taking a wait-and-see approach,” it qouted Datuk Shamsuddin Bardan, executive director of the Malaysian Employers Federation, as saying. The Edge said the Malaysian Institute of Economic Research’s Consumer Sentiment Index (CSI) for example, has fallen to a new six-year low of 71.7 points, which is comparable to the 2008 global financial crisis levels. It explained there was no crash in the job market back in 2008, but then, Malaysia was relatively insulated from the shocks to the global economy. The saving grace was that Asia was the sweet spot for economic growth when the western world was hit hard by the US subprime mortage crisis, it said. For the full report of the state of the employment scenario in the country, read the Edge edition for the week of Oct 19-Oct 25 available now at newstands.